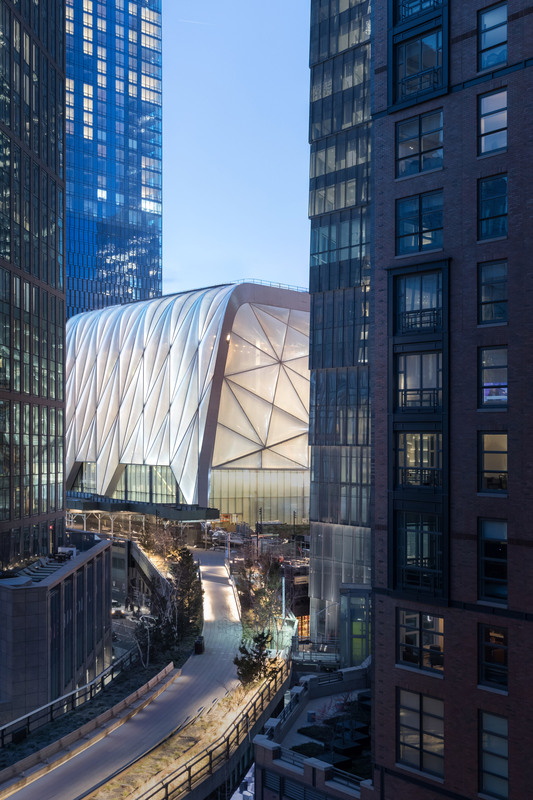 New York firms Diller Scofidio + Renfro and Rockwell Group have completed The Shed, a cultural centre in Manhattan’s Hudson Yards, featuring a retractable roof that can be moved to form a performance area. 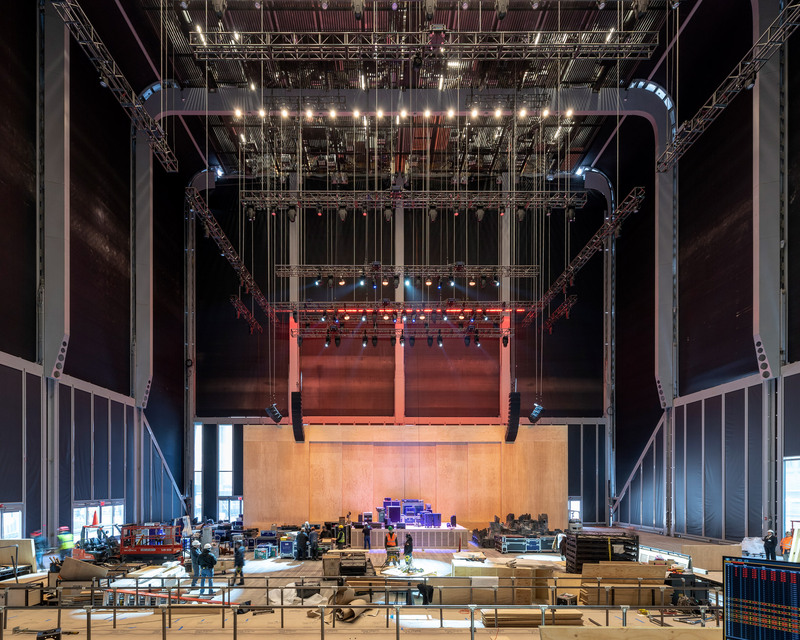 Measuring 200,00 square feet (18,500 square metres), The Shed is a new venue for art-goers located on the northern edge of Chelsea in New York City, forming part of the city’s major Hudson Yards development. The eight-storey cultural institution, which opens to the public 5 April 2019, faces Thomas Heatherwick‘s massive structure, currently named The Vessel, which opened last week. The Shed’s Bloomberg Building was designed by Diller Scofidio + Renfro (DSR), with Rockwell Group as collaborating architect. It features a U-shaped, moving roof that virtually doubles the size of the art complex. The building is intended to be flexible and can physically transform itself, based on the needs and requests of artists using the space. 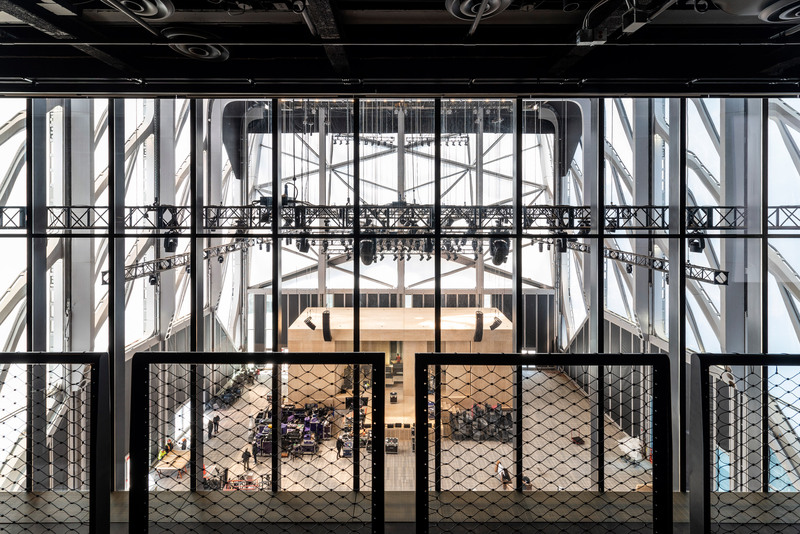 “The building had to be flexible, so flexible that it could even change in size, on demand,” DSR co-founder Elizabeth Diller told a group of journalists at The Shed’s opening on 3 April 2019. “But it had to be flexible without defaulting to the generic, and that’s very very important,” said Diller. The Shed’s retractable roof extends from the base of a nearby tower, viewed from West 30th Street. The structure also had to house various types of arts under one roof. Described as a “telescoping outer shell”, the moveable roof extends away from the main building on bogie wheels to creates a multi-use event space in the adjoining plaza called The McCourt that spans 11,700 square feet (1,087 square metres). “This building will respond, in real time, to the challenges brought on by artists, and hopefully, it will challenge artists back,” she added. The Shed’s moveable shell is made with an exposed steel diagrid frame, covered in translucent ethylene tetrafluoroethylene (EFTE) panels. This lightweight, durable material also has the thermal properties of insulating glass, at a fraction of the weight. The McCourt has radiant floors and black shades that can roll across the EFTE panels to darken the interiors and dampen sound. When the moveable shell is nested over the fixed building, the area acts as an outdoor plaza. The Shed is founded by a team of partners, with designers, industry leaders, businessmen and innovators. The chair is Daniel Doctoroff, who worked closely with the architectural team, as well as Alex Poots, The Shed’s chief executive officer and artistic director. Additional leadership is Tamara McCaw for chief civil program officer, Hans Ulrich Obrist as senior program advisors and Emma Enderby as senior curator. The building features four, double-height levels known as two, four, six and eight. The main entrance for The Shed is on the north side of West 30th Street, and includes a lobby, bookstore and an eatery called Cedric’s. A second entrance is located closer to The Vessel and Hudson Yards’ plaza. Inside, galleries are column-free and feature glass curtain walls with floors and ceilings also supported by thick wires. An upper portion features glass operable walls that can fold fully open to join The McCourt. 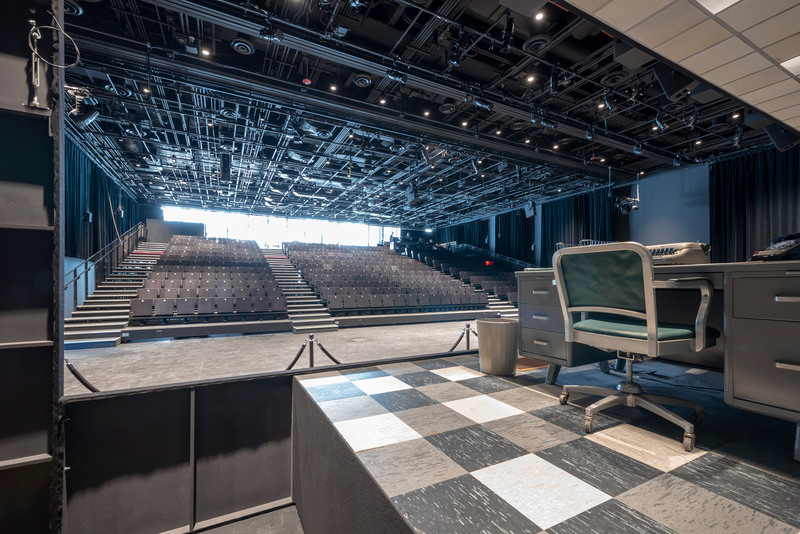 On level six is a sound-isolated black box space, called Griffin theatre, where another glass wall also offers views to The McCourt. Here, will be a showing of The Shed’s inaugural play, Norma Jeane Baker of Troy starring Ben Whishaw and Renee Fleming. 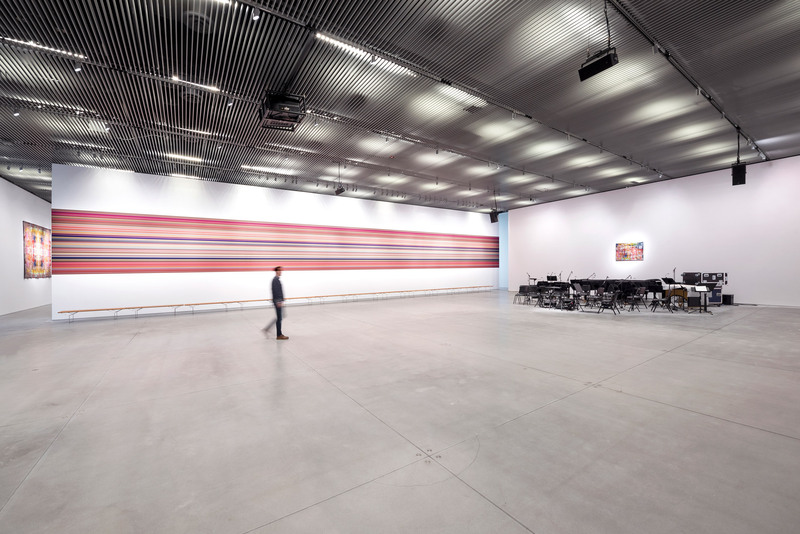 One of The Shed’s opening commissions in its lower level gallery is Reich Richter Pärt, and features moments designed by visual artist Gerhard Richter with composers Arvo Pärt with Steve Reich. Completing The Shed is a top floor that accommodates an event space with a large glass wall and two skylights. Next door is a rehearsal space and a creative lab for local artists. The Shed is positioned at the end of the elevated High Line park, which Diller Scofidio + Renfro designed with landscape firm James Corner Field Operations. 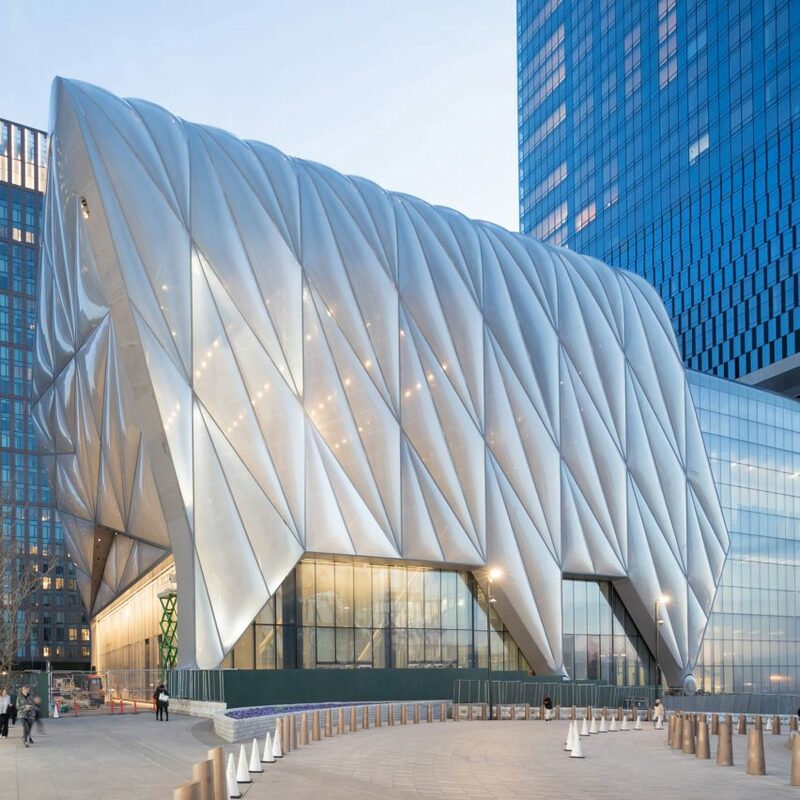 Diller pitched the idea for The Shed 11 years ago, following the completion of High Line, and in response to a request for proposal issued by the city and former mayor Michael Bloomberg. At the time, the area was undeveloped and housed industry and railroad tracks. It was to be set aside by the city for a cultural project, and to span 20,000 square feet (1, 858 square metres) of land at the yard. Bloomberg accepted the team’s proposal, allowing them to design a cultural facility for the Hudson Yards development. “We began the project without a client, but with an ethos and a kind of hunch: an anti-institutional institution that would house all of the arts under one roof, in a building responsive to the everchanging needs of artists, and all media at all scales, indoors and out, into a future that we could not predict,” she continued. The moving shell of The Shed nestles into a skyscraper next door, 15 Hudson Yards, also designed by DSR and Rockwell. The residential tower is part of the towering new commercial and residential area: Hudson Yards. 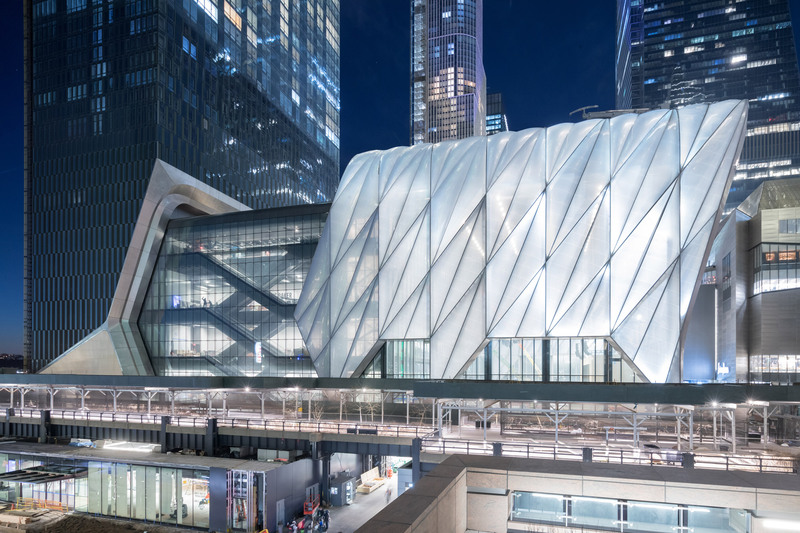 Both The Shed and 15 Hudson Yards share a service elevator, and The Shed’s back-of-house spaces are located on the lower levels of 15 Hudson Yards. The sharing allows the bulk of The Shed’s base to be devoted to as much programmable space for art as possible. Built over the top of a 28-acre (11.3-hectare) active rail yard, Hudson Yards is currently the largest private development in the US. The Shed’s opening rounds out the first phase of the scheme, which also encompasses two sister office towers and another corporate block by development Hudson Yard’s masterplanner KPF. Foster + Partners has also created a tall office building here, and SOM has designed a residential skyscraper here that will accommodate the first Equinox Hotel. Photography is by Iwan Baan courtesy of The Shed, unless stated otherwise. 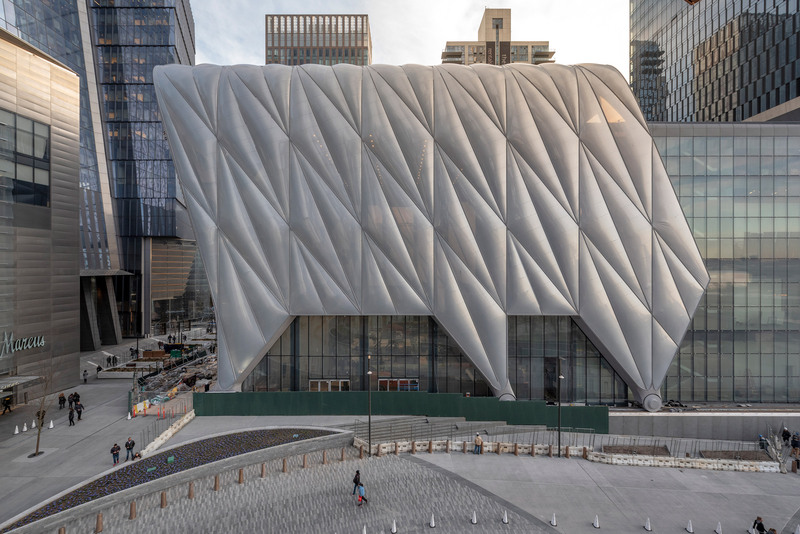 The post The Shed opens at Hudson Yards with huge “telescoping” roof appeared first on Dezeen.